An acclaimed Canadian contemporary realist painter and elected member of the National Guild of Realism, Crystal Beshara is a proud two-time winner of the prestigious Elizabeth Greenshields Foundation prize, among other accomplishments. Beshara's works combine expressive emotion with her technical mastery of realism. Beshara introduces the first of spring blooms in First Blush. Oscillating between vibrant palettes and softer, less presumptuous ones, Sharon Kelly describes her process-oriented practice as both random & controlled, hidden & obvious. The varied, textured surfaces of the resulting paintings ebb and flow like the watery effects which they evoke. Patrice Stanley conjures up the spirits of both post-war Abstract Expressionism and 19th Century Romanticism in this exploration of mysterious landscapes. Stanley is fixed upon the transcendent power of the land, seeking to convey a subjective emotional response to nature. 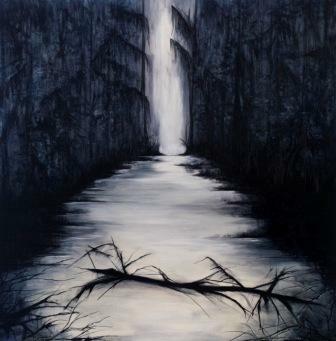 Utilizing a monochromatic palette, Les mystères du bayou noir is a continuation of the Rivers and Bayous series explored by Stanley in 2014. There is an eerie, almost haunting quality to these paintings, which speak to the sacredness and fragility of nature, as well as its mysteries. ELLE CHAE : "For Us To Have Come This Far : So Much For My Happy Ending."